Faculty members Juliet Wunsch, center, and Jeremy Holmes, right, walk a picket line at West Chester University in West Chester on Wednesday. 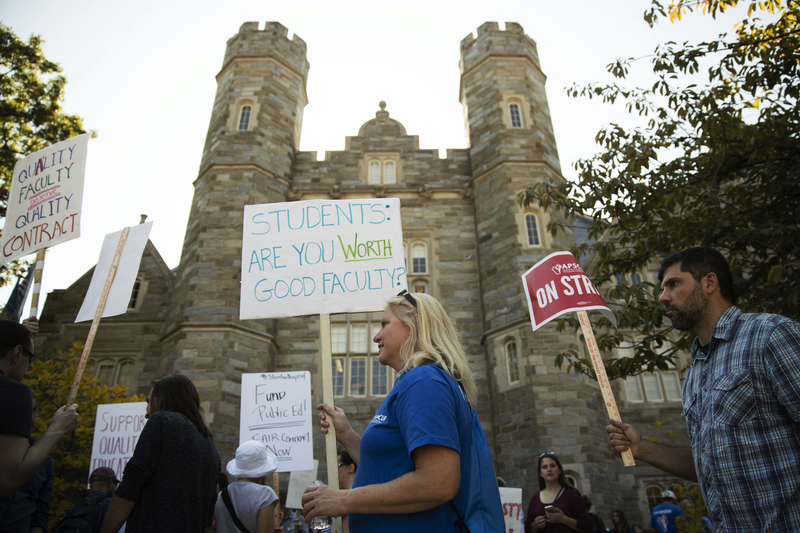 WEST CHESTER, Pa. (AP) — Professors at 14 state universities went on strike Wednesday, disrupting classes mid-semester for more than 100,000 students after contract negotiations hit an impasse. This is the first strike in the system’s 34-year history. State-related schools — Penn State, Temple University, the University of Pittsburgh and Lincoln University — are not affected. The state told students to report for their scheduled classes unless their schools indicated otherwise. As of 6 p.m. Wednesday, no updates were provided from either side on whether negotiations might resume. The school’s approximately 17, 000 students received an email from administrators reminding them the university will not close. The state school system said prior to the walkout that its latest proposal would provide raises to all permanent and temporary faculty members and a health care package identical to what other system employees have.